Jorson & Carlson can supply NEW Drill Heads to fit your Baum, Baum ND, Baum RB, Challenge, HFD, Nygren Dahly, and Lawson style paper drilling machines. Jorson & Carlson will quality repair all makes and models of Drill Heads to OEM specifications. Our highly trained and detail oriented drill head repair center can replace, repair or recondition your drill head. Call one of our sales professionals and inform of your model and what needs repairing and we will provide and estimate and turn around time. Should you prefer to repair in-house, we carry in stock high quality replacement parts and replacement spindles for Lawson paper drill heads. 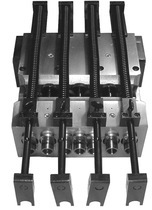 Click on the above drill head you have and view the illustrated head dissection and parts list and call for pricing.